Emerald and Crystal three bead earrings . shown... 4 bead kits with extra large Lochrose flower also available. Choose kits or I will make them for you. 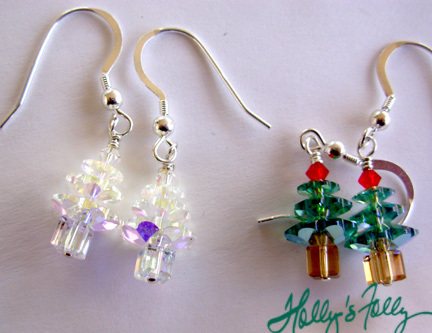 3 Bead Tree earrings contain: , 1 set of earring ss findings, 2 ss head pin, 6 graduated Swarovski Lochrose flowers, 2 – 4 mm Swarovski cube, & 2 – 3 mm Swarovski bi-cones. Available in Ernite AB and Crystal AB & Emerald (not AB).